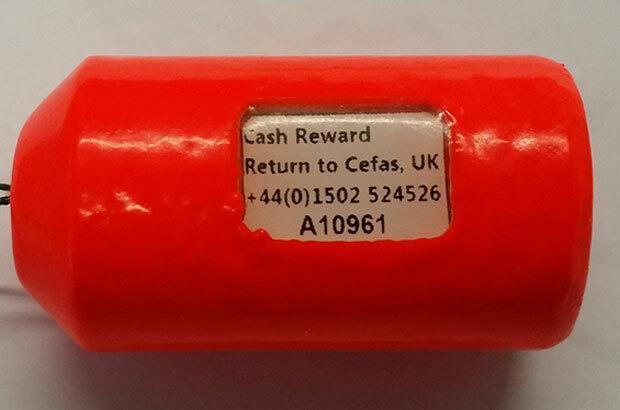 My last post described how both the UK (Cefas) and France (Ifremer) have been tagging sea bass with electronic data storage tags (DSTs). We’re doing this to learn about their behaviour and migration patterns. These tags record the depth and temperature experienced by the fish in the sea every two minutes. All of Cefas and Ifremer’s DSTs have been implanted in the body cavities of our tagged fish. Each DST is encased in a vivid orange “floatation jacket”, which allows the tag to float to shore once released from the fish - even when the fish haven’t been captured. Since my last post we’ve released 48 DST-tagged fish off the Weymouth Coast in November 2014. We then held an “All about that bass” stakeholder engagement session in February 2015 at the Fisherman’s Mission in Newlyn, Cornwall. This meeting also allowed us to train a handful of volunteers in mark-recapture tagging. We’ve got lots to report and share, especially as we’re now getting really exciting results coming back! Firstly, our original plan to tag a second batch of bass off the Sussex coast earlier this year had to be abandoned. Sadly the bass failed to appear in the area in the numbers required to make our tagging operation viable. At that time, we decided we’d better compliment the French tagging study by focussing instead on North Sea bass appearing along the East Anglian coastline. One of our scientists putting a DST tag into a seabass on the boat FV Western Lady. 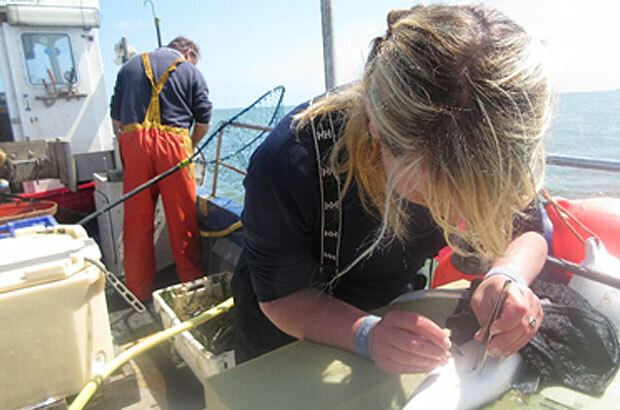 So we engaged the crews of the FV Western Lady (above) and FV Jolene, which allowed us to release a further 44 DST-tagged fish off the coast of Dunwich in May 2015. So far we’ve had a fantastic return rate, with 6 of our Weymouth tags being returned, and our first East Anglian tag before xmas! Two of our Weymouth tags have been returned from beaches, so keep an eye out on the strandline when you’re walking the dog! What our DST tags look like. You get a cash reward for returning them! Clearly the longer that our tags remain on fish before being returned, the more valuable they are because they have more data captured to describe fish movements. However I’m pleased to say that we are already seeing some remarkable results. Firstly, the scale of movement that we are seeing is even greater than we had previously imagined. Our longest track so far is a 300 day record from one of our Weymouth bass. The data show that it swam west following release on 4 November 2014, out into the Western Approaches. It then up into the Celtic Sea where it spent January to March (Quarter 1). 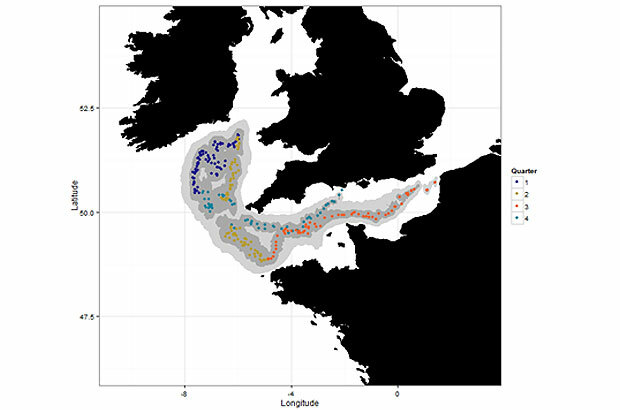 During April to June (Quarter 2) it swam south, approaching the North coast of Brittany before returning to the Channel. The fish continued on an eastward bearing before it was captured by a UK Otter Trawler in the Eastern Channel on 30 August 2015. We’re currently reconstructing the movements of all of our tag returns. I’ll be sharing some of these, along with some of the behaviour patterns recorded, in following posts. Keep an eye out for updates soon. With all of these great results we organised a second “All about that bass” meeting held at the Weymouth Angling Society on 9 December at 17:30. This gave local anglers, commercial fishers, scientists, policy makers and other engaged stakeholders the opportunity to come along and learn first-hand new insights and understanding of sea bass movements and biology we’re gathering from the C-Bass tagging programme. With input from the Southern IFCA, we presented our results to date to an enthusiastic full hall. Our guest speaker, Chris Williams from the New Economics Foundation (NEF), talked about the latest social and economic aspects of bass fisheries. And we also trained another small group of keen volunteers how to tag bass for mark-recapture studies. We’d like to say a big thank-you to everyone who attended, for your continued support, involvement and enthusiasm. For more information, signup to email updates on this C-Bass blog or contact me. You can also follow us on Twitter @CefasGovUK. Means you have identified their spawning grounds and you can give them a secure sanctuary for recruitment with no interference. It is nice to see some work challenging the accepted paradigms . The problem with all fisheries research is it needs to be continual ongoing research that never halts. It is perfectly possible that the previously accepted knowledge regarding site fidelity was true when originally conceived . Oceanic warming and cooling cycles will affect distribution and recruitment of many species , both prey and predatory ,necessitating the need for continual monitoring. There are many more populations of bass around the uk that very little is known about. The Solway firth, firth of Forth,lower Clyde ,loch Ryan,Peterhead, Dounreay and a few other areas north of the border all see bass in varying numbers and size. Until all known populations are sampled the knowledge to manage bass effectively is going to be lacking. Well done on your efforts so far, i hope you get the required funding to continue and expand this project. Hi, Sweet blog. I really love fishing. There is really so many benefits from angling. Think it is great. Apologies for the delay in collecting the bass from you, but thank you for storing it in your freezer and contacting us again. I have spoken to my colleagues at Cefas and someone from our Fish Tagging Hotline team will be in contact with you very soon to arrange collection. Looking at the maps it explains the drop in Bass numbers ,the shoals are targeted by the European fleets in the mouth of the channel when they group up to migrate north as the waters warm up in spring. The present rules restrict the recreational fishers (Anglers and Spearfishermen) but minimal controls on the commercial boats doing the real damage. Its time to ban the large commercial operations from decimating the stocks . Small traditional boats with realistic size and weight limits are the way forward. If the present rules continue another species will be reduced to a rare sighting.